Meet the Emperor 1510. 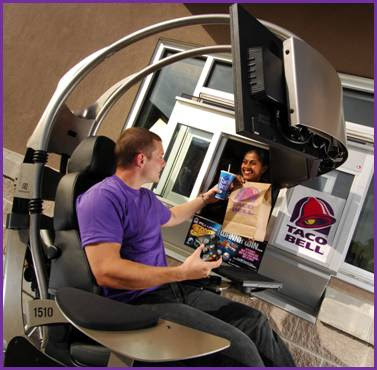 It's the grand prize of Taco Bell's Fill Up On Game Gear promotion and retails at around $10,000. This redonkulous gaming experience makes any chair and PC look like they’re from the Dark Ages. Could you imagine going through a drive-thru in that bad boy? I would love to cruise around the neighbourhood in that thing, lol. LOL, I wonder if there's a training centre? CHECK OUT D-BOX HOME GAMING CHAIR THERE THE FUTURE.THERE COMPATIBLE WITH X-BOX-PS3 GAME CONSOLES. how much can it hold in its data bank uploader? my squad 4020 is a fast 2.2/34 mh sleega downloader importation..... i also wonder its melta functioning system's megadash quadrient explosible 5/2.2...... i dont know who would by an exposed quadrien of 14000...... what IS it? a car or a mobile tv? Hahaha you guys are such comp nerds! Get a girlfriend or something!!!!!! Help!! I am a mom looking for a gaming chair with speakers for my son. Are they worth it and any ideas where i can find them in canada! !